Get the perfect shine by using the hair straightener that glides effortlessly on your hair and renders them silky smooth. The Philips hair straightener provides salon-like results by attaining a high temperature in a matter of seconds, saving you a lot of time while getting ready for a party or work. 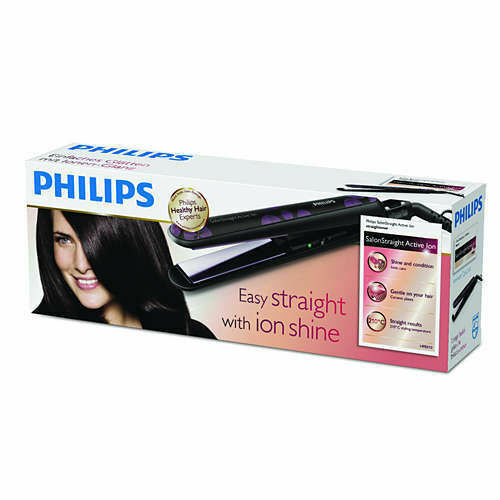 This Philips hair straightener that reaches 210 Degree Celsius and delivers professional, salon-like results to you. The straightener reaches optimal temperature in merely 60 seconds. Ion Conditioning is a special technology offered by Philips. The straightener converts positive (unhealthy) ions into negative (healthy) ones, so as to give your hair a silky smooth appeal. The ceramic plates glide smoothly on your hair and render them straight and shiny. This hair straightener is very safe to use and compatible with voltage across the world. The Philips straightener is universally compatible with voltage. It makes for the ideal travel companion, as you no longer have to carry along a travel adapter. This hair straightener comes with an automatic shut-off feature that ensures that if the appliance will automatically turn off, if left on for over 60 minutes.